Amazon.com Price: (as of 2019-04-18 11:11:36 GMT) Product prices and availability are accurate as of the date/time indicated and are subject to change. Any price and availability information displayed on Amazon.com at the time of purchase will apply to the purchase of this product. Bonus: FREE pack of 6 dealer buttons plus FREE 5-pack of special poker dice that can be used to play a game of poker without cards, a $9.99 value absolutely free with this chip set. These professional grade chips weigh 11.5 grams each and are made of real clay with no metal insert. These premium chips feel and sound as good as real casino chips. Each 11.5 gram chip is made to specifications and is perfectly balanced to give the proper effect. 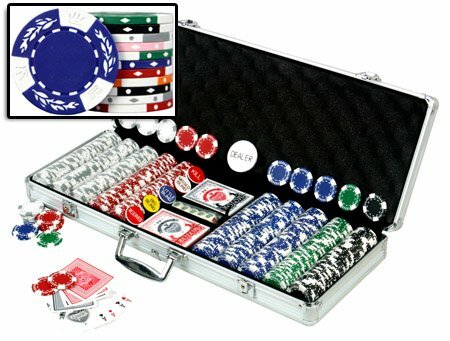 The strong New All Aluminum reinforced case has space for 2 decks of playing cards, 500 chips, and 5 dice, all included. Please note that chip color combination may vary from image shown.